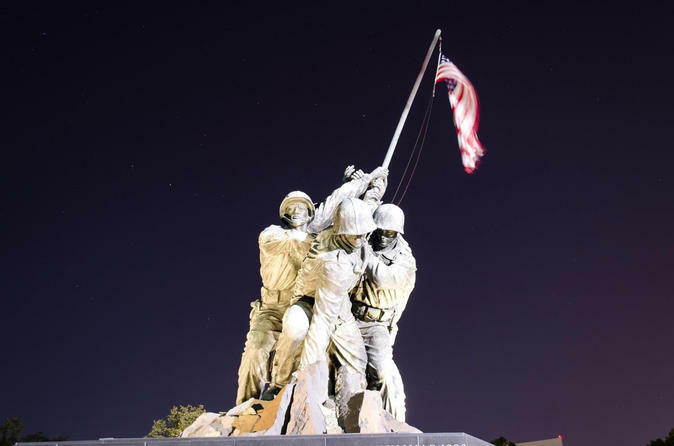 Explore the famous monuments and memorials of Washington, DC at night on this guided, 2-hour, small-group sightseeing tour. Hop on board a motor coach or open-air bus (weather dependent) and enjoy an educational and entertaining narrated history of the nation’s capital. Visit the famous memorials and monuments, with an illuminated view of the Washington Monument, the White House, the Lincoln Memorial, and many other popular points of interest. Meet the guide and the group at Union Station to begin this 2-hour bus tour. Seeing DC monuments at night is a special experience that not many visitors to the city try out. The various landmarks look brilliant while illuminated and with this tour you’ll see so many of them. There are stops on the tour at which visitors can stop off and take a look around, such as the impassive Lincoln Memorial and the inspiring Dr. Martin Luther King, Jr. Memorial. The Lincoln Memorial is one of the best sights to see in the city, as it’s a humbling homage to the 16th president. The architecture of the memorial is astounding and looking upon it is sure to inspire awe in any visitor. War memorials also take pride of place in the city, with the Korean War Memorials, of which look especially striking in the dusk. The Korean War Memorial is made up of 19 life-size soldier figures and, at night, these are illuminated by spotlights. It makes for a wonderful trip for those interested in military history or sculptures. A view from the coach at the Vietnam Veterans Memorial Wall is also a humbling experience and with this tour you can spend time truly appreciating it. There are almost 60,000 names on this war memorial of those who were killed or missing during the conflict. These memorials are just a couple of the most famous in the city and they are truly breathtaking at dusk. The White House is often pictured on television during the day, so not many realize how it looks at night. The entire structure of the iconic building is lit and ,on this tour, you’ll get the opportunity to take a picture in front of it. This is the quintessential Washington DC sight, so you wouldn’t want to leave the city without a photo opportunity. While you’re touring the city, you’ll also get to see more of the city from the comfort of our motor coaches. Travel in comfort as you see the U.S. Capitol Building, Washington Monument, Pennsylvania Avenue and more. Our experienced and licensed driver guide will show you all of the sights and give you insider knowledge on their history.